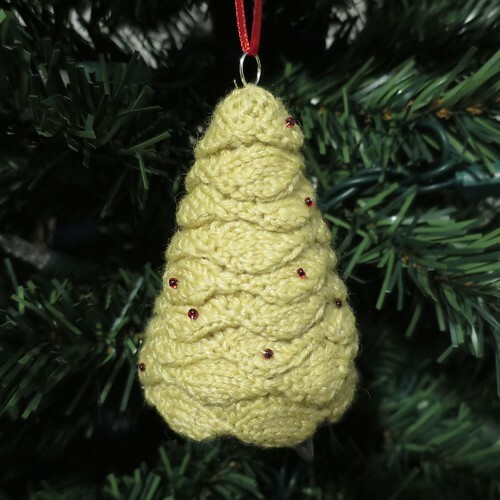 I often see patterns out there to make crocheted scalloped Christmas trees, but hadn’t seen a knit version. So, this week I decided I wanted to try my hand coming up with a design for knitters. 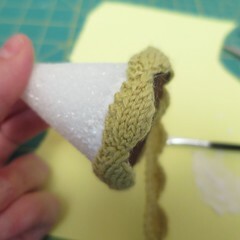 Basically, what I ended up with was a knit scalloped trim that I used to cover a foam tree form. (My local dollar store has these in a couple different sizes.) It took a little trial and error to get the pattern for the scallops just right, but once I did they were a cinch to knit. It’s one of those patterns you memorize after a few times doing. I knit 55-inches of the trim in two evenings. 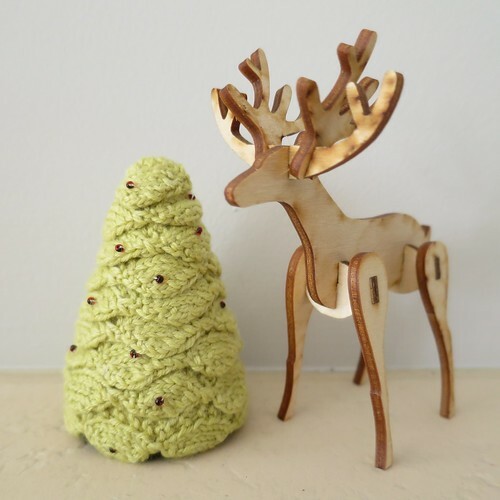 In this small size it is perfect to hang on the tree, but it also looks cute as a decoration on a shelf or table. 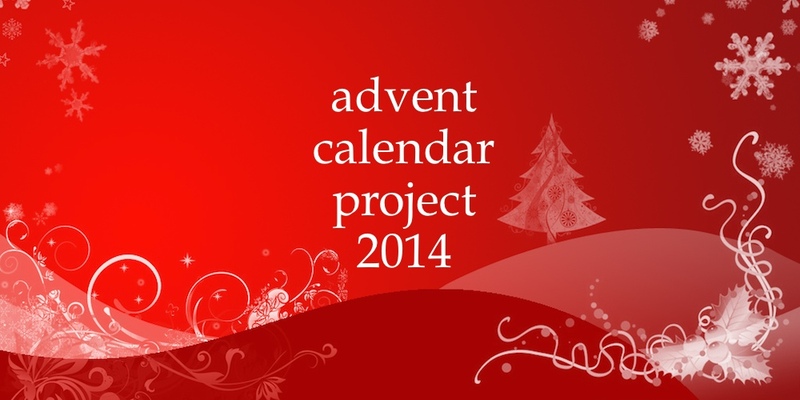 I’m actually knitting up a bigger version right now using sport weight yarn on size three needles for a 7-inch tree. 1. Knit the scallops. I needed 41 scallops to cover my tree, yours many vary depending on your gauge and tree form. I tested until I had the right length, keep in mind blocking will slightly lengthen it, I need one less scallop after blocking. 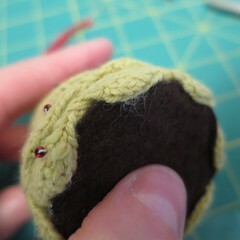 Gauge: Gauge is not super important here, but mine was 8 stitches per inch. 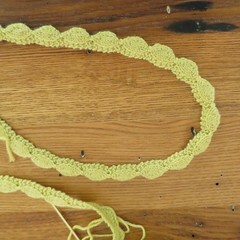 Each scallop was about 3/4 inches wide once blocked. On the last scallop bind off. Weave in ends. 2. Block the trim with a steam iron. Trim before and after blocking. 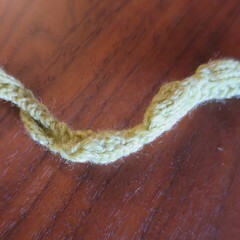 I didn’t even bother to knot and cut the thread between beads. 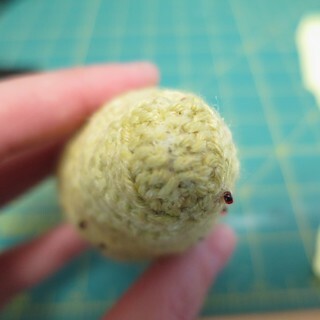 I just wove it behind the knitting to where I wanted the next bead. 4. Cut a piece of felt to fit the base of the tree form and glue it on. 5. Starting at the base, glue on the first round of scallops. 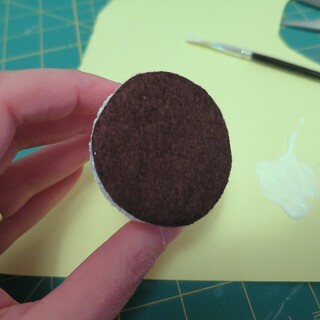 (I found a paintbrush was good for getting this really thick glue on the foam evenly.) You want all the foam to be covered so let the edge of the scallops go under the base a bit. Now continue glueing and spiral the scallops all the way up the tree overlapping each layer. When you get to the top, leave a little of the scallop edging higher than the tree form and glue it down to cover the top. 6. 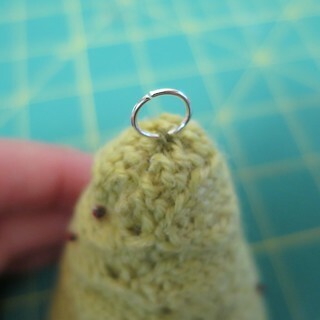 If you want to use your tree as a hanging ornament, sew a jump ring to the top of the tree. Cute idea, but instead of gluing couldn’t you have used the long dressmaker pins. They come in multiple colors and that would have also givien you “the beads” Over time the glue can discolor. Just a thought. You totally could though for the beads to be seen you would be pinning down the scallops. what I glued down was the garter stitch section at the top of each scallop which gets covered with the next layer of scallops. Interestingly enough too, this glue is super thick and did not seep all the way through the yarn, so I’m hoping for no discoloration. 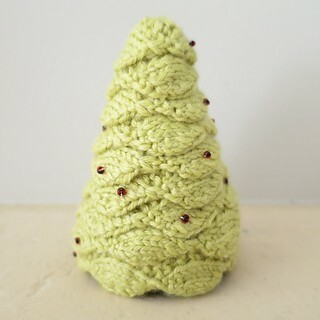 Another idea besides sewing beads on is to use color topped pins as ornaments for trees. 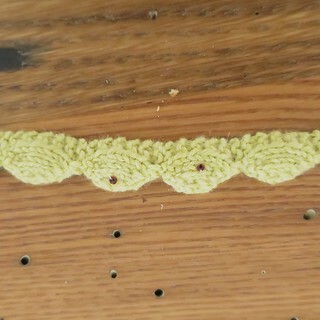 I will have to try this pattern. That would totally work too, especially if you can find some with a little sparkle.